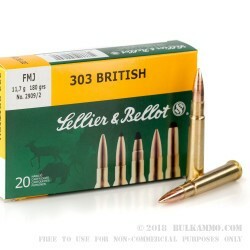 A very high quality load for the .303 British that takes advantage of Sellier & Bellot’s incredible production facilities and the fine attention to detail that has made it one of the most trusted import rounds in the United States that offers military style cartridges. 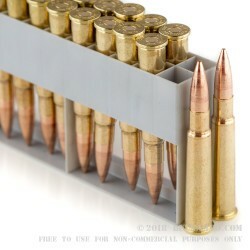 This cartridge is a 180 grain full metal jacket projectile that sits atop a brass casing with a Boxer primer and features top quality components and very solid performance, despite being quite a straightforward load with a simple use case. 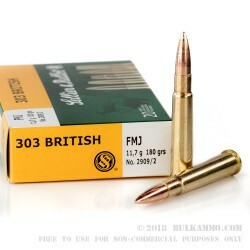 For hunting of big game where allowed by law (as this is a FMJ projectile and a lead based round, make sure your local and state laws don’t prohibit its use); or for target and general shooting, this is a great addition to your .303 rifle that will wring the best accuracy out of the guns you use it in and make them even more reliable than they have been in the past. This round achieves a very respectable 2437 feet per second of velocity out of the bore and 2381 pound feet of energy out of the bore. This translates to adequate power for just about any job you would ask of the .303 British. Q: i have a 1945 brit 303 slightly modified. 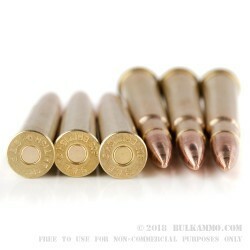 im wondering if these rounds would be good for brush hunting, open range, or just long range defence, also would like to hear of any of your store items you have as far as 22 long rifle, 12 guage 20 guage and even barrel replacement items you might know of if you have any offered, and as far as the 303 round how close is too close to fire a round like this thanks rich. A: With proper shot placement, this .303 180gr FMJ would be an effective hunting round. You might find that better results are realized with a soft point projectile. Also, make sure that it is legal to hunt with an FMJ bullet in your state.